Located close to the Ghanta Ghar around which Jodhpur is built, Zostel Jodhpur manages to stay in Heart of The City : Makrana Moholla. 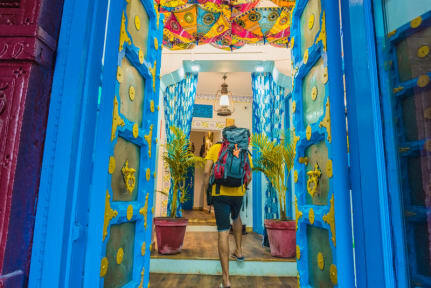 Welcome to the town's coolest backpacker hostel where you can chill in our common area, watch hustle of the town from the cafe & gang up with others to explore Jodhpur. The chilled vibes oozing from the city resonates perfectly with Zostel Jodhpur. Built with the inspiration of Jodhpuri Architecture and Interior. Overlooking the city with their protective gaze. Zostel Jodhpur is close to all the major attractions of the city. The colorful interiors of the hostel mirror the spirit of the city perfectly. Also, enjoy variety of food at our rooftop Multi-cuisine café. Being bored is not an option here. 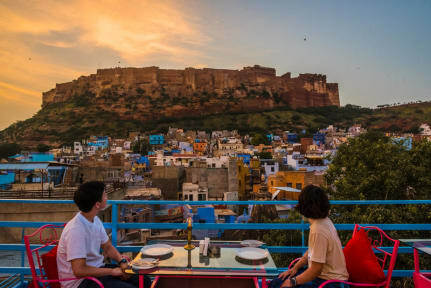 With various stay options suiting all kinds of travelers, be prepared to experience Jodhpur like a local both inside and outside the hostel with Zostel! 3. Check out before 10:00 am. 6. Age Restriction. Guests must be 18 years or more, regardless of whether they are accompanied with adults or not. We do not recommend our hostels to families. 8. In case of a group of 4 or more, you would be purposefully allotted different dorm rooms. - We strictly DO NOT allow a group stay of more than 8 people at any of our hostels. - If the group behavior is deemed unfit at the property, the Zostel Property Manager, upon subjective evaluation, retains the full right to take required action which may also result in an on-spot cancellation without refunds. 10. Local residents/guests carrying a local ID would not be allowed to check in. 11. You are required to make a 100% pre-payment at the time of your check-in. 12. Lockers for your valuables are available in each dorm room, however the hostel will not be held responsible for any lost/stolen/damaged luggage. Had an amazing two night stay at this Zostel. The staff is super welcoming, helpful and friendly and the view from the rooftop is superb! 💯💯💯💯💯💯💯 absolutely amazing. Superbly welcoming staff, extremely friendly and would drop a meal to bring you around if you’re solo! Shoutout to Bhom Singh and friend whose name I can’t pronounce, but leaving for Canada soon. Amazing people I would definitely recommend! Location is great, facilities are well-kept, hygiene of dorms are better than expected. Well done! Hostel stay at Zostel Jodhpur was tremenduously amazing. The location, the ambience, the rooftop restaurant, Every little detail present in the hostel gave you a superb experience. Full recommendations to must visit stay in Jodhpur. Very cooperative and helpful staff. Well located. Amazing view of the Mehrangarh fort from the roof top Cafe. Such a cute hostel. Loved the little decorative pillow on each bed. Beds were comfortable. Only downside was the WiFi barely worked for me and when it did, it never worked in my room which was on the first floor only steps away from the front desk. I had to stand at the front to use the WiFi. Nice common area and awesome view from the roof top! Exellent helpful staff. Nice building with great rooftop and view of the fort. Private rooms good value for money. Bedroom doors don't close unless bolted from inside or outside so gets v noisy and is not secure in rooms as doors always open. Staff somewhat helpful, some had minimal English and could not assist with transport/travel questions. Good location. The location is central, the décor is nice and the rooftop bar is decent, that’s where the positive feedback ends. It was near impossible to sleep - the staff were spitting and shouting loudly throughout he night. Western food was inedible and the staff were untrustworthy - tried to scam us with a camel safari and tried to overcharge for our room. There wasn’t the friendly vibe we’ve received at other places - wouldn’t recommend to a solo traveller.